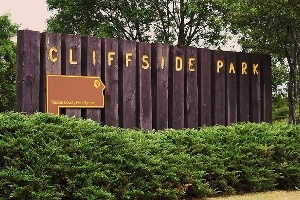 Cliffside Park (map and directions) is situated near the northeast corner of Racine County, Wis., walking distance to Lake Michigan. This county-owned park features all back-in only sites that will accommodate a 45 foot class A motor home with water and electric at each site for RVs or tents. A dump station is also on the property. The campground does NOT overlook the lake, nor is the lake accessible. Check-in in is at 3 pm and check out is at 1 pm. Early check-in not permitted. 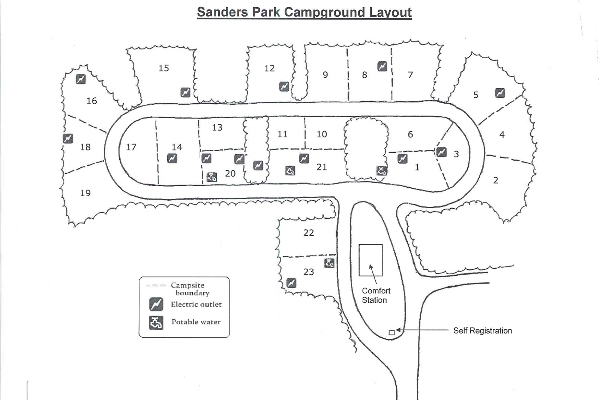 For visitors looking to just pitch a tent, Sanders Park (map and directions) on the south side of the Village of Mount Pleasant is an ideal choice. NOTE: Online reservations will be accepted after 2 p.m. Central Time on the first working day of the New Year. However, in-person reservations will be accepted on the same day starting at 9 a.m.
Site Fee: $28/night (+ $12 nonrefundable reservation fee). 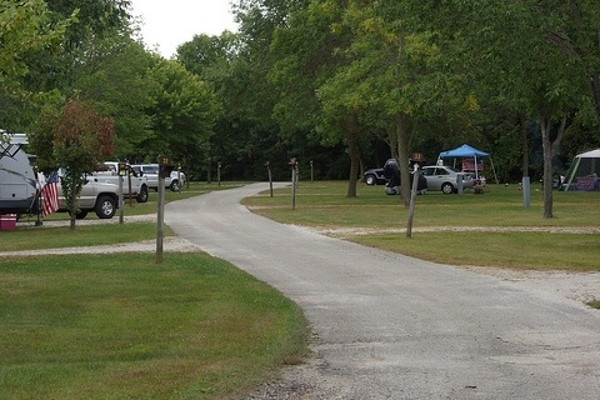 Check-in is at 3 p.m. and check-out time is 1 p.m.
Racine County campgrounds are open from the second weekend in April through the second weekend in October. Refunds: All refunds/reimbursements will be processed within 10 days from the date of the cancellation. Racine County has designated individual camping sites at Cliffside and Sanders Parks. Campground rules apply to all campers. 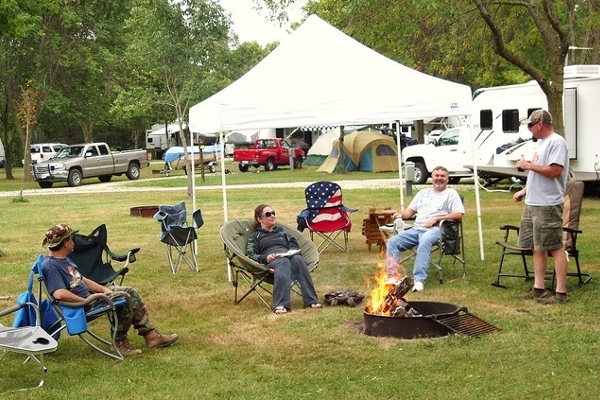 The camping season is the second weekend in April through the second weekend in October. Information on campgrounds and site availability can be obtained by telephone from Real Racine at (262) 884-6400 or 1-800-C Racine (1-800-272-2463). Reservations requested in-person will be accepted beginning the first business day of the given calendar yea, starting at 9am, phone and on-line reservations begin at 2 pm (cst). Reservations may be requested in-person only at the Real Racine Visitor Center, 14015 Washington Avenue daily from 9 a.m. to 5 p.m. The reservation fee and all camping fees for the length of the reserved stay must be paid at this time. Accepted methods of payment are cash, check, Visa, MasterCard, American Express and Discover card. The permit will be issued upon full payment of all fees. Copies of the permit will be given to the reserving party, Racine County Public Works Office, the Park Manager and the Sheriff's Department. Name of park and area requested. First and second choice of camping site. Name of responsible person, address, and daytime telephone numb. Include camping club name if applicable. Payment of the reservation fee and all camping fees for the length of the reserved stay using check or including a Visa, MasterCard, American Express or Discover Card number, the expiration date and signature. Starting the first business day of the New Year, reservations requested in the mail will be put in postmark order and processed after the "in-person" reservations have been processed. The permit will be returned via e-mail. Internet reservations may be made through www.realracine.com after 2 p.m. Central Time on the first working day of the New Year. The reservation fee and all camping fees for the length of the reserved stay must be paid when making the reservation using Visa, MasterCard, American Express, or Discover Card. Your on-line reservation will be processed in the order in which it was received and confirmation will be e-mailed. Reservations requested by telephone will be accepted the first working day of the New Year. Reservations can be requested at Real Racine daily from 9 a.m. to 5 p.m. at (262) 884-6400 or 1-800-272-2463. The reservation fee and all camping fees for the length of the reserved stay must be paid at this time using Visa, MasterCard, American Express or Discover Card. The permit will be returned via e-mail. Reservations for sites 1 through 41 must be made 7 days in advance. Walk-ons are also welcome to site 1-41 if they are not reserved. 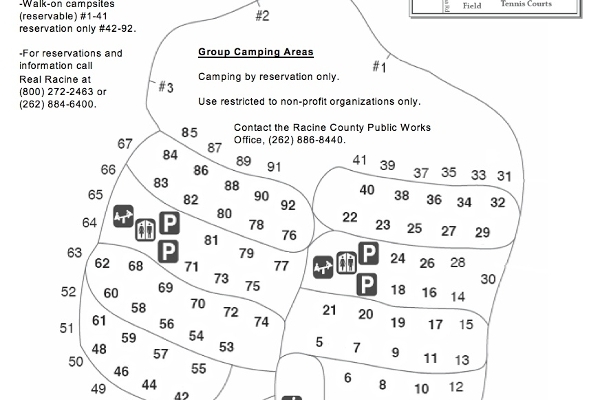 Campsites 42-92 are Reservation Only but reservations may be made the same day if available. ALL changes MUST by madeby PHONE ONLY by 262-884-6400. Email and voice mail change requests will NOT by processed. One change may be made at no charge but additional changes may be charged a $5.00 administration fee per change. Refunds will be processed within 10 days from the date of the cancellation. No-shows receive no refund. If the cancellation is received 72 hours before the 3 p.m. check in on the reservation start date, all camping fees will be refunded. If the cancellation is received less than 72 hours before the 3 p.m. check in but before the 3 p.m. check in of reservation start date, the camping fee minus one night's camping fee will be refunded. If the cancellation is received after the 3 p.m. check in of the arrival date, any remaining camping fees minus two nights' camping fee will be refunded. Those fees incurred before cancellation notification will not be refunded. If the cancellation is received 72 hours before 3 p.m. of the departure date, the remaining camping fees will be refunded. If the early departure notification is received less than 72 hours but before 3 p.m. of the departure date the remaining camping fees less one night's camping fee will be refunded. If the early departure notification is received after the departure, any remaining camping fees minus two night's camping fees will be refunded. Those fees incurred before cancellation notification will not be refunded. If the original payment was by cash, check, or credit card, refunds will be issued by check. The refund may take up to 6 weeks to process. Refunds will not be made without prior notification. No-shows receive no refund. If a change in a camping reservation is wanted, call the Real Racine before arrival date. The request (i.e. changing sites or adding nights to the existing reservation; for canceling nights, see cancellations) will be accommodated subject to availability. Racine County ordinance prohibits the use of a fee area without payment of the fees. Violators are subject to citation. Any site left unoccupied, in which camping fees are not current, is considered abandoned. All personal/camping items will be removed from the site and disposed of. 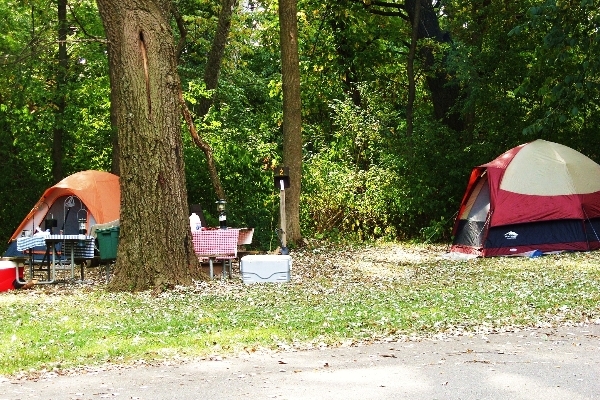 Racine County reserves the right to remove any campers whose site is unkempt and unsightly. A 12-hour notice to vacate will be given and any fees for camping paid in advance will be refunded. 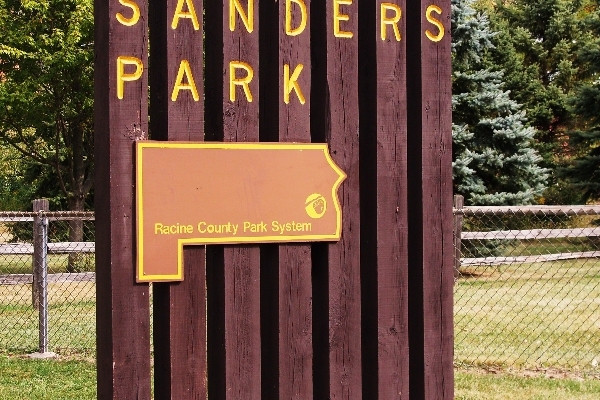 Racine County and their agents reserve the right to make adjustments in the assignments of campsites as becomes necessary due to unforeseen circumstances. Alternate sites will be assigned if requested sites are unavailable.